There are several uses that the Cambro Camwear Platter can be used for in your restaurant. Designed with an oval shape and a narrow trim, this 12 in. x 9 in. 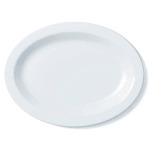 platter is made from light-weight polycarbonate and has a non-porous surface with a smooth glossy finish. The design of this Camwear Platter from Cambro makes it not only scratch resistant but also virtually unbreakable as well. Because this platter is resistant to stains and odors as well, this Camwear Platter is ideal for schools, cafeterias, daycare centers or healthcare facilities as well.